The latest Chesterfield magistrates’ court results as published in the April 6 edition of the Derbyshire Times are listed below. Gareth Grenville Giles, 38, of Bentinck Road, Shuttlewood. Pleaded guilty to driving without due care and attention. Fined £171 and must pay a £30 victim surcharge and £85 costs. Driving record endorsed with six points. Pleaded guilty to using a vehicle without a test certificate. No separate penalty. Samuel Mark Whitaker, 28, of Enfield Road, Chesterfield. Pleaded guilty to having a vehicle registered in their name when it did not meet insurance requirements. Fined £50 and must pay a £30 victim surcharge and £20 costs. Grace Alice Westerby, 27, of Sunnyside, Whitwell. Pleaded guilty to driving without due care and attention. Fined £184 and must pay a £30 victim surcharge and £85 costs. Driving record endorsed with six points. Damien Nathen John Evans, 19, of Cordwell Avenue, Chesterfield. Pleaded guilty under the single justice procedure to driving otherwise than in accordance with a licence. Fined £40 and must pay a £30 victim surcharge. Driving record endorsed with three points. Pleaded guilty under the single justice procedure of riding a motorcycle without wearing protective headgear. Fined £40 and must pay £85 costs. Jade Haynes, 24, of Manor Road, Barlborough, Chesterfield. Convicted of driving while not wearing an adult safety belt. Fined £40 and must pay a £30 victim surcharge and £30 costs. Lewis Kevin Hayward, 23, of Parker Avenue, Calow, Chesterfield. Pleaded guilty to speeding. Fined £70 and must pay a £30 victim surcharge. Driving record endorsed with three points. Mark Andrew Hewitt, 34, of West Lea, Clowne. Proved under the single justice procedure that he drove otherwise than in accordance with a licence. No separate penalty. Proved under the single justice procedure that he used a vehicle without insurance. Fined £120 and must pay a £30 victim surcharge and £85 costs. Disqualified from driving for six months. Marlusz Gorka, 27, of Wheatley Avenue, Somercotes, Alfreton. Convicted of speeding. Fined £70 and must pay a £30 victim surcharge. Driving record endorsed with three points. Sophie Ann Orton, 23, of Sutton Hall Road, Carr Vale, Bolsover. Pleaded guilty to speeding. Fined £70 and must pay a £30 victim surcharge. Driving record endorsed with three points. John Allen Wilson, 73, of Middlecroft Road, Staveley. Pleaded guilty to driving a vehicle without due care and attention. Fined £80 and must pay a £30 victim surcharge and £85 costs. Driving record endorsed with six points. Dane Lee Wright, 26, of Castle Hill, Eckington. Proved in absence that he drove a vehicle otherwise than in accordance with a licence. No separate penalty. Proved in absence that he used a vehicle without insurance. Fined £660 and must pay a £66 victim surcharge and £85 costs. Driving record endorsed with eight points. Michael Luke Kerry, 21, of St Augustine’s Crescent, Chesterfield. Pleaded guilty to driving without due care and attention. No separate penalty. Pleaded guilty to driving otherwise than in accordance with a licence. No separate penalty. Pleaded guilty to using a vehicle without insurance. No separate penalty. Pleaded guilty to being the driver of a vehicle owing to the presence of which an accident occurred whereby damage was caused to another vehicle and failed to report the accident to police. No separate penalty. Pleaded guilty to failing to stop after the accident. Fined £120 and must pay a £30 victim surcharge and £85 costs. Driving record endorsed with eight points. Stuart James Bough, 66, of The Glebe Way, Old Whittington, Chesterfield. Pleaded guilty to exceeding the alcohol drink-drive limit. Fined £346 and must pay a £34 victim surcharge and £85 costs. Disqualified from driving for 12 months. Lloyd Mitton, 22, of Ash Grove, New Tupton, Chesterfield. Pleaded guilty to exceeding the alcohol drink-drive limit. Community order to last until March 29, 2018, with 80 hours of unpaid work. Must pay a £30 victim surcharge and £85 costs. Disqualified from driving for 24 months. James Arron Britland, 31, of Birchwood Crescent, Grangewood, Chesterfield. Pleaded guilty to failing to provide a specimen of breath during an investigation into whether he had committed a driving offence. Fined £200 and must pay a £30 victim surcharge and £85 costs. Disqualified from driving for 12 months. Koran Linford Palfreyman, 23, of Cressbrook Avenue, North Wingfield, Chesterfield. Pleaded guilty to assault by beating. Community order to last until March 26, 2018, with a Rehabilitation Activity Requirement and 80 hours of unpaid work. Must pay £200 compensation and an £85 victim surcharge and £85 costs. Pleaded guilty to failing to surrender to custody. No separate penalty. Samuel Joseph Frank Weaver, 28, of Clowne Road, Barlborough. Pleaded guilty to assaulting a constable in the execution of his duty. Community order to last until March 26, 2018, with a Rehabilitation Activity Requirement. Fined £80 and must pay £100 compensation and an £85 victim surcharge and £85 costs. 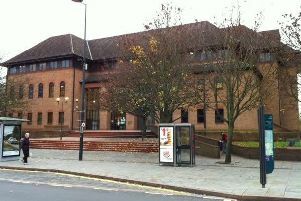 Sharon Carty, 48, of Sheffield Road, Chesterfield. Convicted of assault by beating. Community order to last until March 27, 2018, with a Rehabilitation Activity Requirement. Fined £120 and must pay an £85 victim surcharge and £85 costs. Elizabeth Kay Wedge, 54, of Bevan Road, Danesmoor, Chesterfield. Found guilty of assault occasioning actual bodily harm. Committed to prison for ten weeks suspended for 12 months with a Rehabilitation Activity Requirement. Restraining order to last until March 27, 2018. Must pay £150 compensation and a £115 victim surcharge and £350 costs. Paul Anthony Knowles, 34, of Kipling Road, Newbold, Chesterfield. Pleaded guilty to drunk and disorderly behaviour in public. Discharged conditionally for one year. Must pay a £20 victim surcharge. Patricia Ann Salt, 65, of New Road, Barlborough, Chesterfield. Admitted failing to comply with the requirements of a community order by failing to comply with a curfew and failed to attend with a responsible officer. Community order varied to include a Rehabilitation Activity Requirement of up to 25 days. Julian Van Waller, 45, of St Augustine’s Crescent, Chesterfield. Indicated a guilty plea to undertaking or assisting in the retention, removal, disposal or realisation of stolen goods namely a Honda Rotovatar. Discharged conditionally for 12 months. Must pay a £20 victim surcharge and £85 costs. Vijay Odera, 37, of Tibshelf Road, Holmewood. Pleaded guilty to possessing cannabis or cannabis resin, a controlled class B drug. Pleaded guilty to a further count of possessing cannabis. Found guilty of being concerned in the fraudulent evasion of the prohibition on importation of cannabis in relation to 84 grammes of the class B drug. Community order to last until December 27, with a Drug Rehabilitation Requirement and a Rehabilitation Activity Requirement. Must pay a £60 victim surcharge and £750 costs. Fined £750. Lesley John Cox, 29, of Thorntree Court, Grangewood, Chesterfield. Pleaded guilty to stealing razors and toothbrushes. Committed an offence during a suspended sentence order. No adjudication. Dealt with for the original thefts which were subject to the order of stealing joints of meat, three jars of coffee and three packets of Lenor Unstoppables, and three bottles of perfume. Must pay a £115 victim surcharge. Committed to prison for ten weeks.